T-shirts can be an excellent addition to the fundraising toolkit of your nonprofit organization! People love receiving t-shirts. And, as a fundraising and marketing tool, t-shirts are incredibly adaptable to the exact needs of your organization. Just as a great website is the digital face of your campaign, design your t-shirts to be the physical face of your campaign! Creating a distinct image in the minds of donors and attendees is key to retaining their continued engagement. Determine the general purpose of your t-shirts. Find the right online t-shirt platform for your needs. Incorporate your t-shirts into your fundraising strategies. Market your shirts to your supporters. 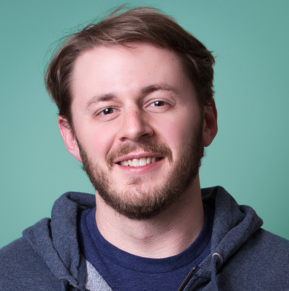 T-shirts are a tried-and-true method for kicking your creative fundraising campaigns into high gear, and for good reason. Read on for some easy, actionable steps to get starting making t-shirts for your nonprofit today! 1. Determine the general purpose of your t-shirts. While it’s never easy to simply ask your donors for money, it’s much easier to offer them something as a reward or in exchange for their support. That’s where t-shirts come in. So what exactly should your custom t-shirts accomplish for your organization? T-shirts and other branded material can serve any number of purposes for nonprofits, and these purposes will affect the ways that you design and market the shirts to your donors. T-shirts are a perfect solution for nonprofits because they easily accomplish multiple tasks at once: they’re affordable, they promote your cause, and people will be happy to purchase them. When deciding exactly what you’ll use t-shirts for in your campaign, it’s best to take a flexible approach. Certainly focus on one or two main purposes for your shirts in order to best target your design and marketing later on, but always feel free to adapt your t-shirt plan as you go. There’s a reason t-shirts have long been an extremely reliable fundraising tool! 2. Find the right online t-shirt platform for your needs. Now that you’ve generally identified what you’ll do with your custom campaign t-shirts, it’s important that you do a little research into your options for platforms. You might simply plan to buy the shirts for your organization to distribute and use, or you might plan on offering donors the ability to order their own shirts. Either way, an ideal online t-shirt platform should encompass any of your needs. Versatility is key when choosing a platform, because your plans for using your t-shirts might change mid-campaign. By choosing an online t-shirt platform with the flexibility to adapt to your fundraising goals, you can ensure that your organization will get the most out of its custom t-shirts. 3. Thoughtfully design your t-shirts. Let your shirts’ general purpose and the context of your campaign guide your design choices. For instance, a school fundraiser might need uniform t-shirts for its parent volunteers, and a healthcare advocacy group might want to offer t-shirts for purchase at a busy street festival. The basic designs of these two shirts would likely be quite different. Attract attention? Shirts that you’ll offer your supporters and that will promote your cause should feature eye-catching and attractive design and clearly feature your logo and any text. Communicate information? Shirts meant to promote or commemorate a specific event, like a major raffle or auction, charity concert, or marathon should also clearly feature your branded elements but will likely contain more text on the front or back. Identify your staff and volunteers? Shirts that will identify your personnel at fundraising events should prominently or solely feature a main color from your branding as well as your logo prominently placed. Overall, the best rule of thumb for nonprofit t-shirts is simplicity. This way you’ll be able to maximize their usefulness and appeal. Plus, donors are much more likely to repeatedly wear a cleanly designed shirt more often than a jumbled one. Design the best shirt you can, not only so that your supporters will want it but also so that they’ll wear it for years to come. This kind of natural exposure is invaluable to building relationships within your community. 4. Incorporate your t-shirts into your fundraising strategies. Once you’ve designed your shirts and either ordered them or created ways for your donors to order their own, it’s crucial that you actively incorporate them into your fundraising strategies. Since t-shirts are already among the most reliable and versatile fundraising tools out there, this should be pretty easy. Your nonprofit can (and should) always do much more than simply set out a stack of shirts in a booth or post one link about them on your weekly email newsletter. Peer-to-peer fundraising pages. Let your core peer-to-peer fundraising volunteers create individualized team shirts to engage your supporters in fundraising competitions. Offer your shirts as a direct fundraising item. 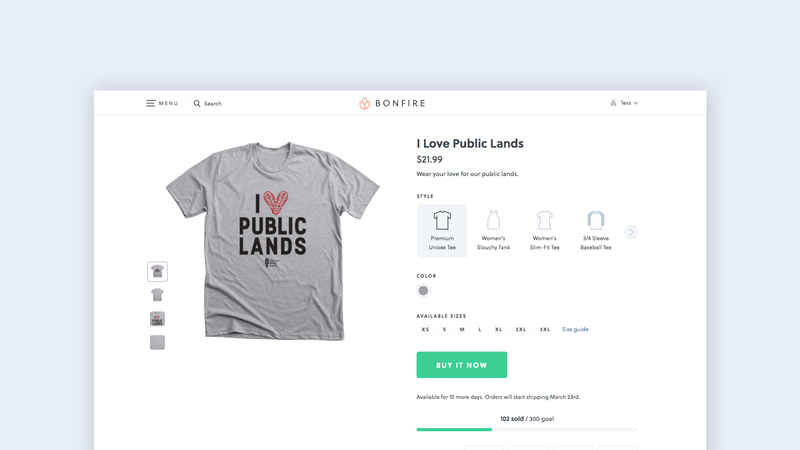 T-shirt fundraising platforms like Bonfire make it easy to raise funds and direct supporters to simple campaign and order pages. Get creative when thinking of ways to incorporate t-shirts into your campaigns. Just think about the type of event or fundraiser that you're hosting and see if selling t-shirts can fit in. For example, if you're raising money for kids you could sell your shirts before the event and have attendees wear your merchandise on the big day. The possibilities are endless! Custom t-shirts can serve as rewards, incentives, or standalone fundraising items, but most importantly, they can serve multiple of these purposes at once for your organization. There are easy ways to incorporate your t-shirts into all types of fundraising campaign. Your supporters will respond to your shirts in any fundraising context, so experiment and find the best ways to engage them and generate interest. 5. Market your shirts to your supporters. It’s important that as soon as you design your shirts and outline some ways to incorporate them into your campaign, you begin promoting them to your most dedicated supporters. In addition to using shirts as promotional tools and donation rewards, it’s important that you retain the ability to simply sell them to interested donors. Provide a direct option to add a shirt right on your donation page. This can also be helpful if you plan on offering t-shirts as thank-you gifts for larger donations. Feature your custom shirts and merchandise on your website. You could create a dedicated merchandise or online store page for your supporters to visit. Include your t-shirts in your social media marketing by featuring images of supporters wearing them. Be sure to include links for followers to order their own shirts. Remember that regardless of how you incorporate t-shirts into your organization’s branding or fundraising campaigns, it’s important that you provide multiple easily accessible ways for your supporters to buy their own if they want to. Of course, with an adaptive t-shirt fundraising platform, your donors will have the ability to order a shirt whenever they want. By including links and instructions on all your marketing materials, you’ll get the most out of your custom t-shirts. Follow some best practices on optimizing your campaign pages when looking for ways to include and market your t-shirts. Follow these core steps and you’ll feel proud of your perfectly designed custom shirt. Most importantly, you donors will be proud to wear the shirt of an organization that they value and support.